It's only shades of gray: 28 metal disks redefine the essence of Portland gloom. like to walk around; it's the best way to take the pulse of civilization  like taking the city's temperature, visually. When I'm walking around Portland the visual scene unfolds before me at a completely human pace that's totally different than being in a car. So basically, this is what I've seen and heard in the galleries, movie houses and on the street. 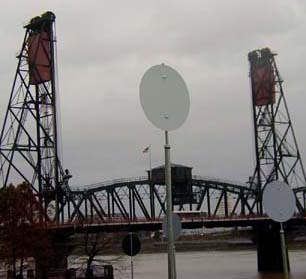 Throughout Portland's notoriously gray winter, a team called Artclub (Laura Domela, Ellen Goldschmidt, Allen Kinast, Karen Lynn and Kari Djuve) will have an outdoor installation in place along the Willamette River. The temporary RACC-funded work consists of 28 metal disks on nine-foot-high poles, each with its own specially named designer shade of gray. A genesis for the idea stems from the Inuit culture's 50 words for snow, and asks how many shades of gray we Portlanders can define. The disks look and feel quite temporary and make the ever-changing sky seem more permanent than the steel poles. This inversion undermines the conceptual heft somewhat but it could be fixed with more monumentality. Although the idea is a bit too clever and tries a little too hard to be amusing, it works for civic art. In fact, it works a lot better than Judy Pfaff's ODS building installation. Maybe a permanent version will find a home in one of the new Pearl District construction projects. What really works great, though, is Artclub's daily Web-poll asking us to vote for the shade of gray that best approximates our view of the heavens. Artclub even has T-shirts and mugs for sale. I like how scrappy these Portland artists are. They don't get too precious  I can appreciate that. And I want the T-shirt called Ennui, the perfect gift for the Baudelaire reader in your clique (www.domela.com/artclub/). David Lynch: exploring scarily familiar themes. One of the recent visual events I had looked forward to was David Lynch's newest movie, "Mulholland Drive." Venue-wise, I saw it at Northwest Portland's venerable old Cinema 21, a great choice. Seeing it in a vintage theater is much different than seeing it in the pristine Fox Tower, but I'll get into that later. My take after seeing "Mulholland Drive": I think Lynch's complex, fragmented storytelling and rather frayed plot strings fit the post 9-11 world real well. I get the impression mainstream America got closer to Lynch's aesthetics, not the other way around. 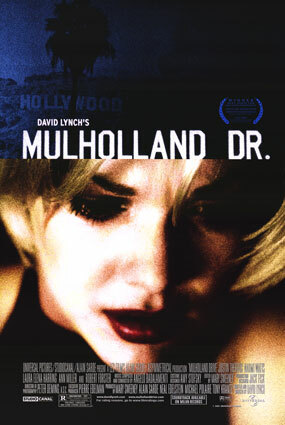 In many ways "Mulholland Drive" is a refinement of so many of Lynch's favorite themes: demonic control, troubled relationships based on control and obsession, references to classic Hollywood, and the descent of doomed characters into a fate that we already had visited earlier in the film. David Lynch's "Mulholland Drive": doomed characters, hijacked reality. In this movie Lynch's vision gelled in a way that other films, like "Fire Walk With Me" and "Lost Highway," didn't. In "Mulholland Drive" the dissonance somehow rings true to life  as if the relationship between the two main characters, Betty and Rita, literally did go to hell. Whereas in "Lost Highway," Bill Pullman's character seems willed into his scary situation by the director himself. That's the thing about movies, we judge them in terms of believability. And with "Mulholland Drive," Lynch kinda hijacked my reality. The Cinema 21 venue was perfect, because when the movie finished and the lights came on, I turned around and felt as if I was still in the movie. The grand old theater's garish red velvet and ancient seats filled with exasperated moviegoers made me feel like I was about to star in my own David Lynch flick  as if a bunch of albino cowboys might come out and sing me a Roy Orbison song. In fact, after leaving the theater, all the drunken revelers coming out of Muu Muu's restaurant next door and the Gypsy club across the street took on a certain demonic aspect. The coup de gras occurred when a friend and I decided to go to a sushi place kitty-corner from Cinema 21. It has big windows and you can see the street as you eat. Suddenly a young fellow and his date stopped and the young man garishly put his face and mouth to the glass. I just sort of made a mental note: "Hi there, demon boy." 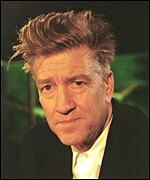 Eventually I think the unagi and the wasabi I was eating finally broke Lynch's spell.